Dental Implants can be used for more than just replacing a single tooth! Replacing multiple teeth using Dental Implants can add unparalleled strength and stability that restores form and function. Additionally, multiple Dental Implants can help preserve your jawbone and facial appearance while allowing you to live normally! When several neighboring teeth are missing, an Implant-Supported Bridge can be an optimal treatment for replacing them. Unlike a Single Dental Implant, which consists of a crown and the dental implant screw, multiple teeth can be replaced by multiple Dental Implants supporting fixed bridgework. If you are missing several teeth, your South Calgary Periodontist will work closely with you to determine the most effective solution for your case. Multiple Dental Implants can be used to support dentures or dental bridges. This option provides you with significantly more support alternatives. 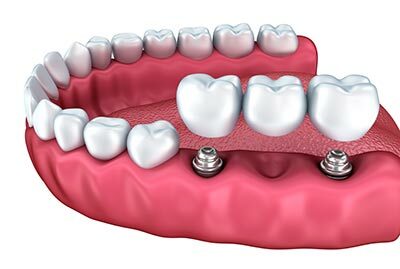 A Dental Implant-Supported Bridge is very similar to a regular dental bridge, but instead it is supported by Dental Implants and not by the surrounding natural teeth. In most cases, one implant is placed in the jawbone for each missing tooth. Then the dental crowns are connected to the Dental Implants to form one complete piece. Implant-Supported Bridges are used when more than one natural tooth is missing. It may also be used when your periodontist is concerned that you might be putting too much pressure on individual Dental Implants that are not connected to each other. For example, you may clench or regularly grind your teeth while sleeping. This puts extra pressure on the individual Dental Implants. It also increases the chance that they may loosen from the bone and fail. By using an Implant-Supported Bridge, you can reduce the overall pressure on the individual Dental Implants and spread the forces on your teeth across the entire bridge. It is important to know that your existing natural teeth and surrounding gums must be in good health before moving forward with this procedure. Otherwise, you will have to explore supporting the bone structure by using bone augmentation or gum grafting before moving ahead with the implant procedure. You will be able to easily clean the area between the gums and the bridge itself. Your periodontist may recommend a special type of floss or a small brush for this specific type of cleaning. Otherwise, you can treat your Implant-Supported Bridge exactly like your own natural teeth! Call us at (403) 278-5446 to book your Dental Implant consultation appointment today!